The club coordinates a program of rock climbing trips on Tuesday evenings at crags in and around the central belt. The programme for trips is given below. 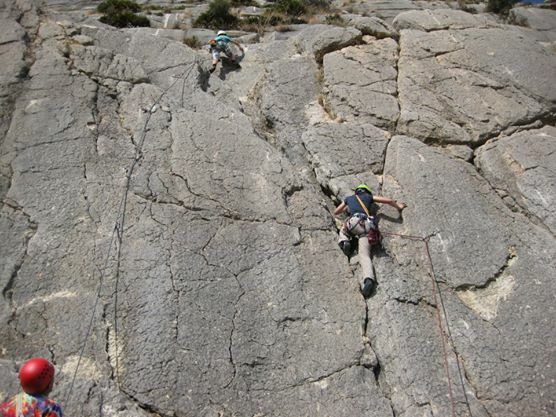 The meets are aimed at all climbers and are suitable for beginners to outdoor rock. No formal coaching is provided but we will try to pair up more experienced partners with those with less experience to 'show them the ropes'. People generally meet from about 5–6pm at the crag or arrange to share lifts. During the winter (or if it's raining) a group of Jacobites climb each week on Tuesday evenings from about 6pm, at either Alien Rock 1 or the Edinburgh International Climbing Arena at Ratho. If you would like to join us then email MidweekRock@jacobitesmc.co.uk or come along to the pub. The club acknowledges the BMC participation statement, please see here for further details. The club encourages the use of helmets while climbing. The club can lend you a helmet if you do not have one. The summer programme each year starts towards the end of April. See the calendar below for venues and dates. In the summer, also see the list on the right with details of where each venue is and how to get there.